The 1970s Diet: These Jeans WILL change your life! I'm back. Yes, sorry I always go a bit quiet during half term - I barely twitted or blogged during our week and one day off school. Its always nice to be engage in the real world from time to time isn't it. But I can assure you I'm back to my virtual existence. I have so much to say and blog about but just haven't found the time to fit it in. Many a blog post is brewing in the blog compartment of my brain! So what of the diet? Well not great last week as I did NO exercise - I don't count out and about with the kids as exercise. And out and about we were too. My son had a track session and a mountain bike session at Herne Hill Velodrome, with his friend, which he loved. Although it was so muddy for the mountain bike session his bike was caked in the stuff as was himself. Whilst the boys had their session, myself and a friend took our other offspring to the Horniman museum (yes you heard that right!) and did our best to kill 5 hours - no mean feat when its drizzly and not great weather - still we managed it somehow. We were well and truly mixing it with the middles over at Dulwich way. My sister says "don't be obsessed with class" when I make observations. I'm not 'obsessed' but there is a type of parent that frequent establishments and have poncey names for their children and it does amuse me somewhat. You can spot them a mile off. They are the parents that get down to the childs level, whilst the child is sprawled on the floor getting in everyones way and generally being a spoilt brat. The parent is all mamby pamby and says "now Lucas please darling get up" whilst my friend and I are thinking the same - "UP, NOW!" Its just the way it is. On the diet front I took my trusted ryvita with me but ended up eating 7 jaffa cakes - 50 cals in everyone of those buggers - shan't be doing that again in a hurry. The following day we decided coffee and lunch at mine would be much more preferable. I ate more than I would ordinarily last week. I was out for an all you can eat Chinese buffet with my sisters on Saturday night washed down with copious amounts of wine. Having said all this, I didn't put on any weight! An expert at that it seems. Even with the chocolate chip muffin I consumed when my two friends were over. I asked if they wanted one (which weren't purchased by me) and they were like "er yes". However, my friends are no more than 10 and a half stone - mental note to self - slim people can say yes to chocolate muffins. I can't. The kids were off today - inset day - but I have decided to make time for my exercise in the evening if I am unable to do so in the day so, after a full on day with the kids, I got on my bike after tea and cycled 12 miles with hills. I think that's a good start to Monday don't you think? I am planning another ride tomorrow evening possibly with my son and weights in the day. I'm taking each day as it comes. It is now June and Vegas is November. Finally, on Saturday the hubster and I went shopping whilst leaving the kids with my parents. I forgot how exhausting browsing and trying on clothes can be. Firstly, the air conditioning dries your eyes out and the getting in and out of clothes you have to shoe horn yourself into isn't much fun. I don't often have a good try on of clothes but I'm glad I did. Everything looks hideous when you're fat. I hate my arms and one 1950's dress I tried on in Monsoon (yes I was that desperate) made me look like a big fat sugar plum fairy. 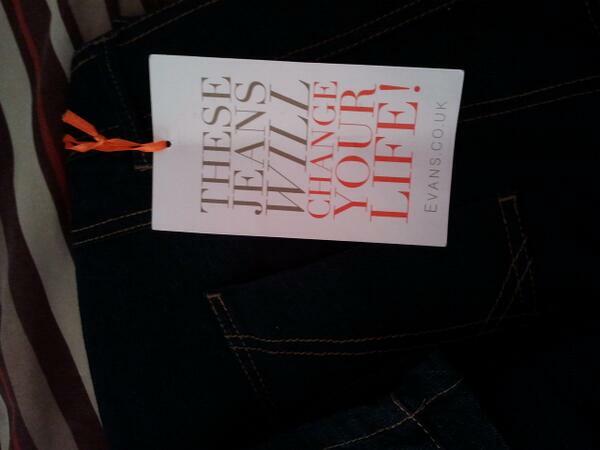 "These jeans WILL change your life!" the label said. Well I'm all for jeans changing my life so I tried them on - they recommended going down a size and I probably should have got a 14 as they are slightly lose around the knees. But they sit on the waist and no bakery top going on. So I bought two pairs! I highly recommend them to anyone who hates the hipster jeans and want a comfy pair of jeans to go out and about in. Okay the bakery top isn't gone but it certainly contains it. Believe it or not this isn't a sponsored post for Evans but it bloody well should be! I can't believe during the lifetime of my blog the amount of times I've put in links and what not on things I like totally naive to the fact that you can actually get paid for doing this! I can see the telegrams to Evans - SITUATION DESPERATE STOP PLEASE SEND JEANS STOP. But maybe I'll try a pair next time in town. I NEED some of those jeans!! Going on to Evans' website right now. I might have to give these a go too! I don't wear jeans because of muffin top!